British pig farmers' body BPEX has launched a digital campaign to encourage consumers to eat pork products during the summer months. The organisation, which now operates under the "Love Pork" consumer brand, is looking to target groups of families and friends eating picnics over the summer. 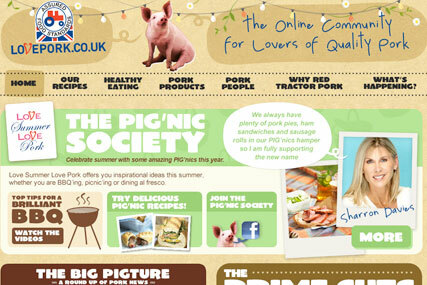 Making reference to the 19th century London picnic society, the "PIG'nic Society" campaign, by Tribal DDB, will be fronted by former Olympic Silver medallist swimmer Sharron Davies. A new campaign section has been added to BPEX’s consumer website, Lovepork.co.uk, and a dedicated Facebook page has also been launched. Earlier this summer, BPEX rolled out a campaign encouraging women to get involved with barbeques during the World Cup. The Girls Guide to Grilling was fronted by 'Live From Studio Five' presenter Kate Walsh. Both BPEX and EBLEX, the English Beef and Lamb Executive, are managed by the Agriculture and Horticulture Development Board.